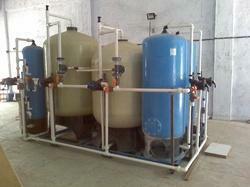 We are one of the prominent manufacturer, trader and service provider of DM Plants. These plants are manufactured using top quality raw material. Demineralization is the process of removing mineral salts from Water by using the ion exchange process. Demineralized Water also known as Deionized Water, Water that has had its mineral ions removed. Mineral ions such as cations of sodium, calcium, iron, copper, etc and anions such as chloride, sulphate, nitrate, etc are common ions present in Water. Deionization is a physical process which uses specially-manufactured ion exchange resins which provides ion exchange site for the replacement of the mineral salts in Water with Water forming H+ and OH- ions. 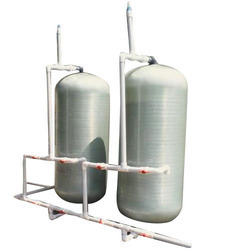 Because the majority of Water impurities are dissolved salts, deionization produces a high purity Water that is generally similar to distilled Water, and this process is quick and without scale buildup. De-mineralization technology is the proven process for treatment of Water. A DM Water System produces mineral free Water by operating on the principles of ion exchange, Degasification, and polishing. Demineralized Water System finds wide application in the field of steam, power, process, and cooling. Being the leading names in the industry, we offer our clients functionally advanced range of De Mineralisation Plants that are acclaimed among the clients for durable standards. They re performance oriented and requires minimum maintenance. We offer them in varied technical grades and are treasured for high strength and wide industrial applications. Backed by advanced technologies and modern techniques, we offer our clients a comprehensive range of Softening Demineralizer Plant that are manufactured using quality assured raw components and advanced technologies. They are durable in nature and require minimum maintenance. Our entire product range is thematically balanced.